Simple, decent, affordable housing for all; this is Habitat for Humanity’s worldwide goal. Habitat builds, renovates and repairs houses with the help of homeowner families, volunteers, and donations of money and materials. 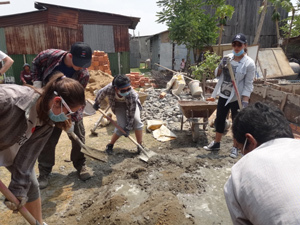 In Brillantmont’s sixth year of collaboration with Habitat, a team of eleven students and teachers – Ms Ho Tai and Mrs Brown – took part in an extra curricular school activity with a difference, by heading to Cambodia for two weeks over Easter. It was the first time that a European school has visited this particular project. The building consisted of foundation work, making rebar, mixing and laying concrete, transporting lots of sand and bricks, as well as helping to build the walls of the new house. In 40 degree weather, the tasks were challenging but rewarding. 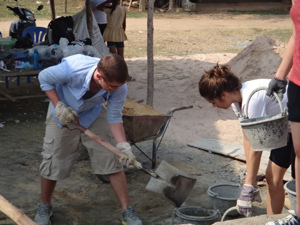 It was the first time the school had joined a Habitat project in Asia and everyone was thrilled to have such an incredible opportunity to help a family in need, in addition to learning about Cambodian culture and history. Jeremy from the USA says, "Coming from Switzerland we are very privileged, but over there everyday things are more challenging, such as having clean water to drink and a mosquito-free bed to sleep in. Yet, despite having so little, the people were so warm and welcoming; it was a very humbling experience."